Top 10 Best Embroidery Software for MAC and PC Reviews 2019 Guide! Shopping for the best embroidery software for MAC or PC that 2019 has to offer? Here are the best selling embroidery software options from the best brands on the market today and the top 10 best ranking embroidery digitizing software for this year! Check out my TOP 10 embroidery software reviews, easy to navigate comparison chart to find the best Brother embroidery software, Embrilliance Essentials embroidery machine software, Amazing Designs embroidery software, Digitize n Stitch software and much more! Please SCROLL if on mobile! The best way to expand your design ability when working with the best sewing embroidery machine and to be able to customize your embroidery is to use the best embroidery software of course! There are plenty of types of embroidery software on the market today, including free embroidery software to paid versions. Today I will concentrate on the best quality embroidery software, 10 top-best embroidery designing software and the best-ranking embroidery software. My No.1 best Embrilliance embroidery software and the top ranking Embrilliance software is, of course, the Embrilliance Essentials embroidery machine software for MAC and PC! This comprehensive embroidery software comes with tonnes of features and functions, that are super easy to use for both professionals and embroidery beginners. Embrilliance Essentials are compatible with both PC and MAC, which means, regardless of which computer you have, these guys got you covered! With this Essentials embroidery software, you have total control of your embroidery designs! Best Selling Embrilliance Essentials Embroidery Machine Software for MAC and PC! 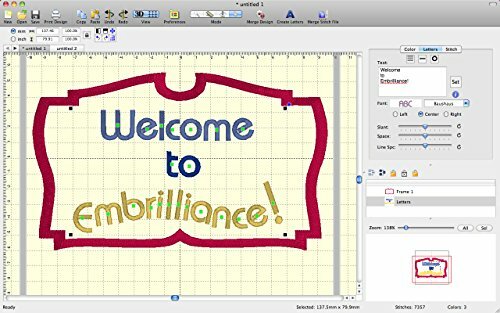 Embrilliance Essentials embroidery machine software allows for a full control of editing, resizing with automatic stitch recalculation, merging, as well as overlapping your designs. With this software, you can also add monogramming, lettering in Multi-Line, format appliques, colorize and convert thread brands on your designs, and remove understitching as well. As an added bonus, this software allows you to connect to your computerized embroidery machine. This means, that you that the benefits of this Embrilliance Software for embroidery are endless! Basic computer skills are necessary here. The price is a little steep, but worth every dollar! Amazing Designs embroidery software, as the name suggests, is quite amazing! This software has proven itself to me time and time again! With a tonne of features this Amazing Designs embroidery software, this is your go-to embroidery software when it comes to single or multi-line lettering or text embroidery. Best selling Amazing Designs embroidery software! Amazing Designs Letter it! embroidery machine software allows you to create sensational single and multi-line embroidery lettering in a large variety of styles and fonts. Some of the best layouts include the Vertical Text, Path Text and the Circle, which are super easy to use and customize. There are 35 lettering fonts, including normal styles and the whimsical as well. This embroidery software allows you to customize your designs with ease and with the use of the stitch simulator print, you will be able to preview your design before stitch. Brother Embroidery software ELS Version is packed to the brim with quality features and easy to use tools. 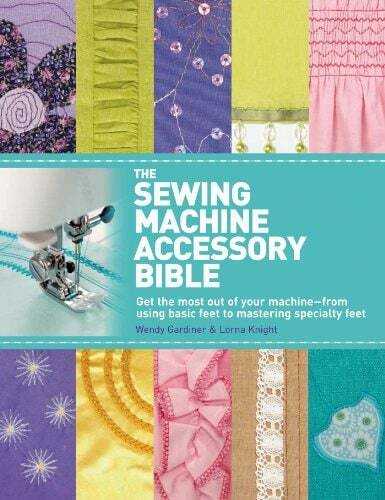 I personally use Brother embroidery machines and I swear by their products! Not only this embroidery software is made by a very reputable and highly ranking brand, but it is also ranking at the top of the leaderboard in its own category! This software is ranking as the best Brother SE400 embroidery software and the best embroidery software for Brother PE770 as well! Best selling Brother embroidery software! This Brother embroidery software comes with 20 built-in pre-digitized embroidery fonts, 5 monogramming styles and 40+ decorative monogramming frames. It also has 3 built-in text styles and 14 decorative patterns as well. Yup, it is packed to the brim! This is a genuine Brother made accessory and it is compatible with most of the computerized embroidery machines. This is the best embroidery software for Brother machines, of course. Tip: Works best with a genuine Intel Pentium IV 2GHz and up, and with 1GB RAM. Need to connect to the internet for activation. Once you save a design, you cannot edit it again. The fonts seem to be quite similar to each other. Amazing Designs monogramming software, as the name suggests, is an amazing monogramming software and highly recommended by thousands of happy users. Monogramming is made easy with the right tool and Amazing Designs Monogram it! software has literally been made for the job! Best monogram embroidery software this year! Amazing Designs Letter it! comes with 24 monogramming fonts, including 2 applique fonts, 25 built-in monogramming frames and 39 built-in embroidery designs. This software allows you to create one-colour monograms with up to 4 letters. You can also edit your designs till the heart is content by using rotate, flipping vertical and horizontal, and also play with the advanced coloring functions. Tip: Requires Intel Pentium IV 2.0 GHz or up, 1GB RAM, and 1 GB HD space. Embrilliance embroidery digitizing software StitchArtist is all about creating your own customized embroidery designs and for a fraction of the price! Embrilliance Stitch Artist software is your “build-your-own” amazing embroidery designing software! This is one of the best embroidery digitizer software on the market today! The Embrilliance digitizing software allows you to create new, or use the existing designs and alter the designs as you see fit. The software will guide you through the steps of creating new designs with ease. And I am not just saying that. One of the best ways to get used to this Embrilliance software is to use the single mode. This way you can create and edit, draw, rotate, set properties and change sizes of the design. Don’t worry here though, the easy-to-follow guide will help you step by step. 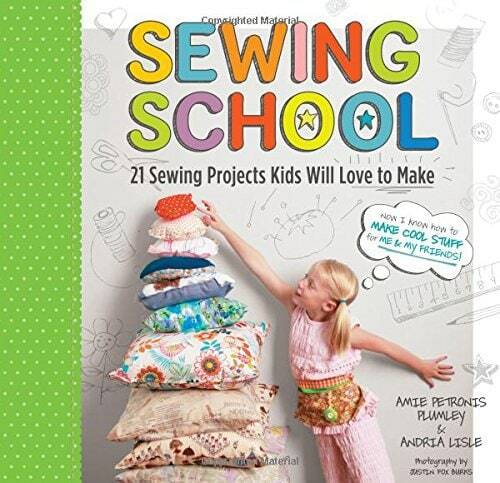 Tip: Can read and write PES format for Brother JEP and SEW for Janome, SHV for Viking, HUS for Pfaff PCS and VIP formats, ART for Bernina, Commercial.DST and more! Make sure to read the instructions properly before you start fiddling with “make your own” designs, as it can be tricky. Embrilliance Enthusiast embroidery software is deservedly sitting in the top ten of the best embroidery software for MAC and PC. And what’s even better, your license can let you run the program on multiple computers, including cross running on PC and the MAC. Yes, this is a little bit more expansive embroidery software, but it is a monster of a package. Just check out the features! Best embroidery software for customizing designs! Embrilliance Enthusiast Software comes with an advanced threader editor, sizing controls (when combined with other titles) and advanced stitching properties as well. The program also has fantastic stitch editing options, multi-hooping, baste hooping, Mirror X 4 and the precise position functions. One of the best things about this program is that the license allows you to use it on multiple computers at the same time and cross match PC with MAC as well. The price tag is a bit steep, but it is proving to be worth it! BuzzXplore embroidery design software is the best software for embroidery design management. This is one of the best tools to organize your embroidery designs on your computer, and definitely our favorite! This management embroidery software is going to sort out all of your designs and allow you to browse through them in a similar way as the Windows Explorer does. Best embroidery design software for managing designs! Buzz Xplore embroidery design management software V2 Premier is the best tool for organizing and managing the embroidery designs. The program comes with an embroidery drive writing, great convert embroidery formats, and graphics support. The program has been designed with an easy-to-use user experience for effortless navigation and design locating. Although it is easy to use, be patient here! It may take a while to get used to the program at first. Amazing Designs Digitize n Stitch software is an auto-digitizing program that allows you to bring in your favorite scanned images or simple clip art and convert them to embroidery stitches! This program has no limits. Regardless of how simple or intricate the design, you can create it with Digitize n Stitch! Best embroidery software for converting files to embroidery designs and ranking as one of the best digitize embroidery software! Digitize n Stitch software is designed to create unique applique, amazing embroidery designs, borders, and cross-stitching with ease. All you have to do is to click through the wizards and you are ready to go. This program allows for full control of the designs sizes and it is compatible with most of the file formats, including JPG, BMP, PCX, TGA, TIF, WMF, EMF, AI and Vector. Tip: This is embroidery software for PC only and it is compatible with Windows 7, 8 and 10, Intel Pentium III and up, 256 MB RAM and 1024 x 768 VD. Although it is easy to use, make sure to read through the instructions first. Also, may need a faster computer to work properly and not lose out on time. 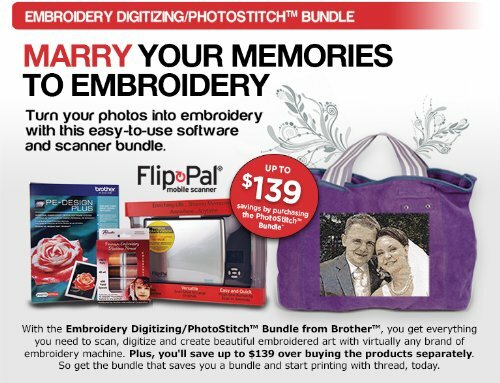 Ok, so this might be the most expansive Brother embroidery software package on sale this year, but it is worth it! All you got to do is three easy steps! Scan your photos with the Flip Pal portable scanner, digitize it with the Brother PE Design Plus and stitch it with the premium embroidery Fleshtone thread! Sounds good? Because it is! The best Brother embroidery digitizing software and PhotoStitch package! Brother PE design embroidery software is a great tool for digitizing embroidery designs and patterns. The package includes everything that you need to scan, digitize and create amazing customized embroidery art! The bundle includes the Brother PE Desing Plus Digitizing/PhotoStitch and Flip-Pal mobile scanner. This is all that you need to get going! Tip: Flip-Pal is a great tool to scan your family photos to ensure that they will never get lost or get old. It is expansive! But is it a bundle, so it is the best value for money embroidery software. If you are looking for a cheap embroidery software then the Embrilliance Thumbnailer is the right pick for you. This is the closest to the free embroidery software that you can get! At the pocket-friendly price, this is a no-brainer for both beginners and advanced users. The best cheap embroidery software on the market today. Embrilliance Thumbnailer machine embroidery software is easy to install and it comes with tonnes of great functions and tools. Although it is cheap software for embroidery, you will be able to produce quality designs. Thumbnailer Embrilliance is compatible with 28 of the embroidery file formats and it comes with 6 quilting formats as well. The program allows you to preview your designs as you go and will display embroidery formats in zipped folders as well. Tip: Great with MAC OSX v:10.5 and up, Windows 7, 8, 8.1 and 10, Vista and Windows XP. In plain words, Embroidery software is a program that can create an embroidery design that can be transferred to your embroidery machine, ready for stitching. This software can help you create drawings, lettering, lines and objects, as well as digitize (translate) images from a vector drawing, so you can create amazing embroidery designs! What to Consider Before You Buy an Embroidery Software? There are a number of things to look at before committing to buying the best embroidery software for your needs. If you are a beginner to embroidery business, then you might want to look at basic embroidery software at first. However, if you are an advanced embroidery software user, then you might look at more specific features of the program and check out what types of embroidery software are there and which will be more suitable to your line of work. Choosing the best embroidery software type can be tricky. A lot of the embroidery software specializes in one type of embroidery designs (like lettering, monogramming, or digitizing), whilst others combine the modules together. Digitizer software is designed essentially to translate (digitize) a vector format to a stitch format. Vectorizer software is designed to translate a bitmap image to a vector format (vectorize picture). This means that the picture goes through a linear transformation making it ready for digitizing. Editing software allows you to have full control of the creative part of the embroidery design. This is where you can usually start from the scratch and progress through all of the vectorizing, digitizing, and all the way to creating final stitches. Monogram or lettering software is specifically designed to produce optimized stitching fonts. Some of the software may include a combination of lettering and other modules, whilst specialized lettering embroidery software will concentrate purely on one thing. Personally, I would go with the specialist. The most perfect embroidery software that you can get is the one that is compatible with your computer at home! Unfortunately, not all of the software is designed with that in mind. Whilst some are Windows (PC) specific, others can are compatible with the MAC as well. To avoid disappointment, make sure to check the compatibility of the software to your embroidery machine as well! Only after those things are ticked, then click the buy button. Some of the embroidery software come with an array of built-in features including embroidery patterns, lettering or designs. These can be edited to create your own customized designs. This may be a deciding factor to consider before choosing the best embroidery software for your needs! We all know the saying “You buy what you pay for!” and when it comes to getting a top embroidery software for your style of embroidery or needs, this is no different. Depending on how advanced your skills are, or what type of software module you want to work with, the prices may vary. The best way to look at prices of software is to not compromise the value of the program for how much it costs. These programs are very much affordable, but some of them are cheaper than others. Please check out the comparison chart for current prices on each item. Most of the top embroidery software brands will have great customer service, forums for questions and answers, and other methods of contact. Getting a quick and efficient customer service can be crucial when it comes to choosing the product. Should you run into problems, you do not want to be stuck with unresolved issues. So make sure to check out the brands’ support system before you buy. As you may know, there are a large number of copy-cats on the market these days, and unfortunately, this includes the embroidery software too. Make sure to check your copy before you buy, and should you have any issues, contact the products’ customer service as soon as possible for help. Top 5 Best Embroidery Online Shops for all Embroidery Needs! 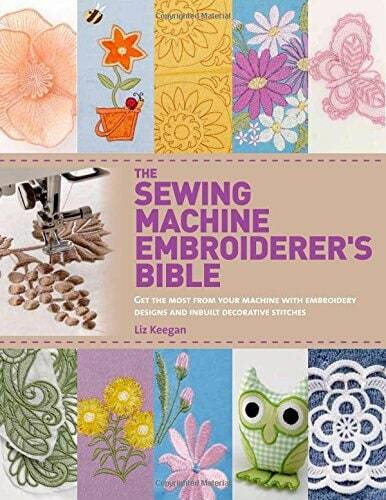 Embroidery Machine Tips for Beginners – 2019 Ultimate Beginners Guide!